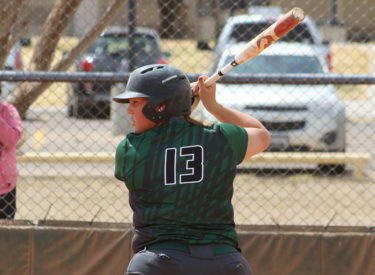 LIBERAL, Kan. – The Seward County softball team (32-16, 19-3) picked up two more conference wins to add on to their single-season conference wins record, sweeping Northwest Tech at Lady Saints Field 10-2 in game one winning from the run-rule before holding on for a 7-4 victory in game two. Monique Ashley (22-4) started in game one, pitching a complete game, while giving up just two runs off five hits. She struck out five batters along the way. Seward finished with 13 hits as Kaitlin Ammermann, Sydney Epp, Sage Harrison, Corrina Porras and Paige St. Pierre each finished with two hits. Harrison and Miranda Nester led the Lady Saints with two RBI apiece. The Lady Saints started off hot in the first inning, scoring four runs right out of the game. After the first two batters got out, Epp hit a double to left field to kickstart a rally. Harrison followed up with a double of her own to score Epp before Madeline Owen single through second base to score the second run of the inning. Nester’s double to left center two batters later quickly made the game 4-0. Of the 10 total runs in the game, eight came with two outs for the Lady Saints. In the bottom of the second, Harrison earned her second RBI with a single through the left side of the infield. St. Pierre gave Seward another run in the third with a one out single to center field, scoring Nester who had reached on an error by the shortstop. The fourth inning was the lone inning that neither inning scored, but the fifth made up for it. Two singles by the Mavericks put runners on the corners. With the runner at first attempting to steal, Seward through the ball to second, allowing the runner at third to score. A successful bunt attempt two outs later scored the second run of the game to make it 6-2. Now needing four runs to end the game early, Porras gave the Lady Saints a boost with a lead off jack to right field. Once again, Seward faced two outs and were able to score some runs, this time enough to end the game. With runners on first and second, Ammermann hit a single to right field to score Raelyn Sanchez. An error by the centerfielder allowed Ammermann to reach second, while Atteberry stood at third. Another error, this time on a hit to the second baseman by Epp, scored both Atteberry and Ammermann to end the game 10-2. Jordan Cordrey started in the circle in game two, pitching 3.2 inning and allowing four runs off of eight hits, but it was Monique Ashley (23-4) who picked up the win in relief. Ashley went 3.1 inning in game two, striking out six batters and allowing two hits. The Lady Saints came away with 11 hits on the day. Atteberry, Ammermann, Owen and Nester each finished with two hits, while Ammermann and Nester led Seward with two RBI. Harrison also connected on her 17th home run of the season, now sitting just two shy of tying the single season home run record. Northwest Tech struck first. After two singles put runners on the corners, the Mavericks used a sac bunt to score their first run of the game. The Mavericks lead didn’t last long however. Atteberry led off with a double in the bottom of the first and would score off a passed ball. Harrison homered to left field with the next at bat to give Seward the 2-1 lead. After allowing just one base runner in the top of the second, the lady Saints loaded the bases in the bottom of the second. A single by Ammermann down the right field line scored three runs after the right fielder misplayed the ball to bring the game to 5-1. Northwest Tech used a hot third and fourth inning to cut the lead to just one run. The Mavericks hit a solo home run in the third inning, while using a double and a single in the fourth to make the game 5-4. After cutting the lead to one, Ashley entered the game and got out of the inning, holding the Mavericks scoreless for the remaining three innings. Nester gave the Lady Saints some breathing room with a two-out, two RBI double that bounced off the centerfield wall to bring the game to 7-4. Seward will be home for Sophomore Night at 2:00 p.m. on Wednesday against Barton. The Lady Saints will honor their Most Valuable Person before the first game and the sophomore’s will be honored in between the two games.